banana kale smoothie | Cook It Quick! I just received a third box of food from my farmer, Pekarek’s Produce. Here’s a photo of what I got this week. I’ll be sharing throughout the week what I’m making. My first recipe is a refreshing Kale Banana Smoothie. My husband and I liked it so well I plan to make all the rest of my kale into smoothie cubes for quick smoothies in the future. Following is my recipe for Kale Banana Smoothie. Add milk, then yogurt to blender. Next, toss in the kale. Break banana into chunks and add to mixture. Place the ice cubes on top. NOTE: If you’ve never made a smoothie with ice in your blender, check your blender instruction book or look for your manual online on the manufacturer’s website to determine if there are specific guidelines for adding ice to your blender. Some blenders may not be strong enough to break down ice cubes. Begin blending, starting out on a lower speed and then increasing speed. Puree until smooth. Place liquids in a blender first. It makes it easier to start the blending process. To facilitate the mixing process, start at a lower speed and work your way to a higher speed as the bigger pieces get broken up. 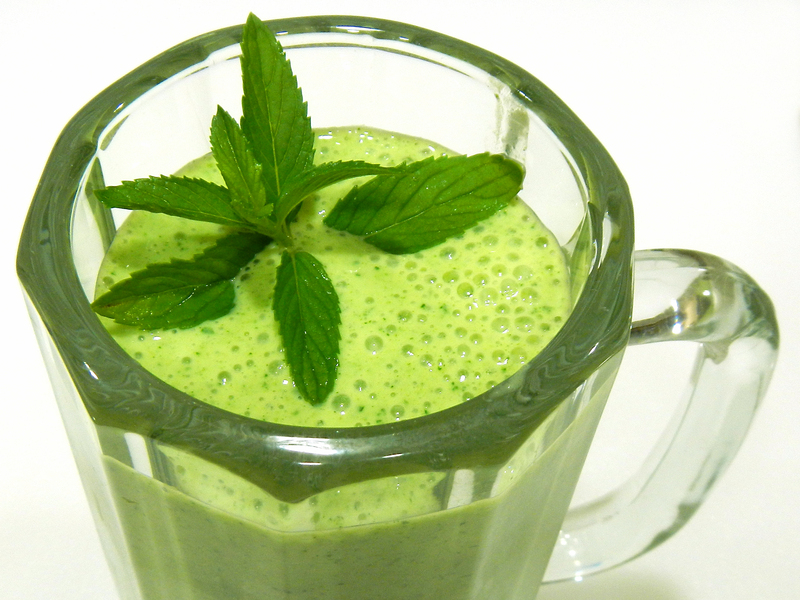 Try a Banana Kale Smoothie – tastes minty and refreshing! I always thought green smoothies were something other people drank! Then, bringing home a big bundle of kale from the Farmers Market, I decided to experiment. Here’s the recipe I developed. I think it tastes refreshing and minty. And … I’m now drinking green smoothies! Makes 1 very large or 2 medium smoothies. Another Tip: Don’t even tell people it’s high in calcium, potassium, vitamins A & C to name just a few nutrients!